Intel unveiled its first ever 8th-gen, Core i9 processor for mobiles and laptops at an event in Beijing on Tuesday, which the company claims is “the highest-performance laptop processor Intel has ever built to deliver the best gaming and content creation experience on the go.” With its latest batch of 8th-generation Core chips for laptops, Intel is focused on delivering even more desktop-like performance. The new 8th Gen Intel Core i9, i7 and i5 processors for laptops are based on the “Coffee Lake” platform, which uses a refined 14nm++ manufacturing process to improve on the company’s previous 14nm architectures, Intel said in a statement. The desktop processors deliver up to 41 percent more frames per second in gameplay or 59% faster 4K video editing compared to the previous generation devices sporting discrete graphics. The 8th Gen Intel Core i9-8950HK processor is the first Intel CPU with six cores and 12 threads that allows users to enjoy the smoothest and highest-quality mobile VR and new Windows Mixed Reality Ultra experiences. 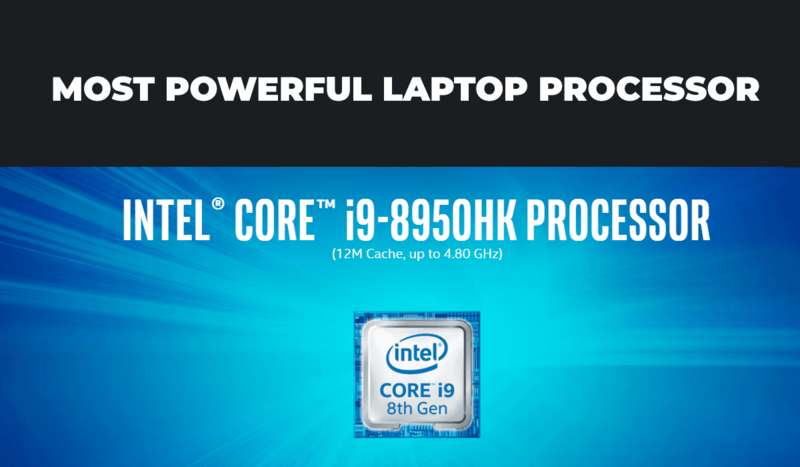 Intel claims that i9-8950HK is the highest-performance mobile processor it has ever created. It gets speeds of up to 4.8GHz with the help of turbo boost [that’s Intel Thermal Velocity Boost (TVB)]. The processor has a relatively massive 12MB cache and is unlocked for overclocking. The new Intel TVB also automatically overclocks the chip if its temperature remains low. The company also launched Intel 300 Series Chipset, which adds integrated Gigabit Wi-Fi for a fast connection, and as per Intel’s claims, it is capable of being up to 2 times faster than standard 2×2 802.11AC 80 MHz (867 Mbps). Additionally, the company also announced a new Intel Core platform extension that combines the benefits of 8th Gen Intel Core processors with Intel “Optane” memory. Intel Optane memory is a smart and adaptable system accelerator for desktop and mobile platforms, increasing the performance and responsiveness of SATA-based storage technology without compromising storage capacity. It is now available across both 8th Gen Intel Core mobile and desktop platforms. Intel is rolling out new Core i9+, Core i7+ and Core i5+ badges for OEMs to promote desktops and laptops that use a Core CPU as well as Optane Memory. For more information about Intel’s Core i9 Processor, you can read the company’s complete news release here.